Scott and I were invited to play trivia at a pizza joint last night. We are terrible at trivia. Between the two of us, we know about as many answers as the average honey badger. I have a popular culture knowledge deficit because for most of my childhood I had a crush on Kevin Costner, listened to Michael Bolton, didn’t watch tv on school nights, mourned the loss of the family guinea pig, and highlighted my text books very, very carefully. And there was head-gear somewhere in there. It is physically impossible to cry over the death of Kurt Cobain and other cultural icons when you’re wearing head-gear. Scott was pressed for his excuse after demonstrating a near total lack of awareness of the late 80s and early 90s. It turns out he spent that entire time at Space Camp. Scott went from Washington, D.C. to Space Camp in Huntsville three summers in a row. He slept in a little space camp pod and ate space ice cream and went on mock space missions to the moon and learned all about stars. He developed a crush on a space camper named Susan. He asked her to be his pen pal. They wrote to each other for years. They wrote to each other about outer space. The Space Camp administrators were so impressed by Scott that they took a picture of him and they put him in the brochure. What we realized last night is that I must have pored over that brochure before convincing my parents to send me to a one-week version of Space Camp in 1992. Twenty years ago, I sat there in my room, rocking the head-gear, listening to When A Man Loves A Woman and staring at a picture of Scott in his coke bottle-glasses. Fifteen years later, after both of us had given up on the final frontier and our respective facial accessories, we met at a bar. In trivia, you do not get points for that kind of awesome. We did not win the free pizza. So we made our own! 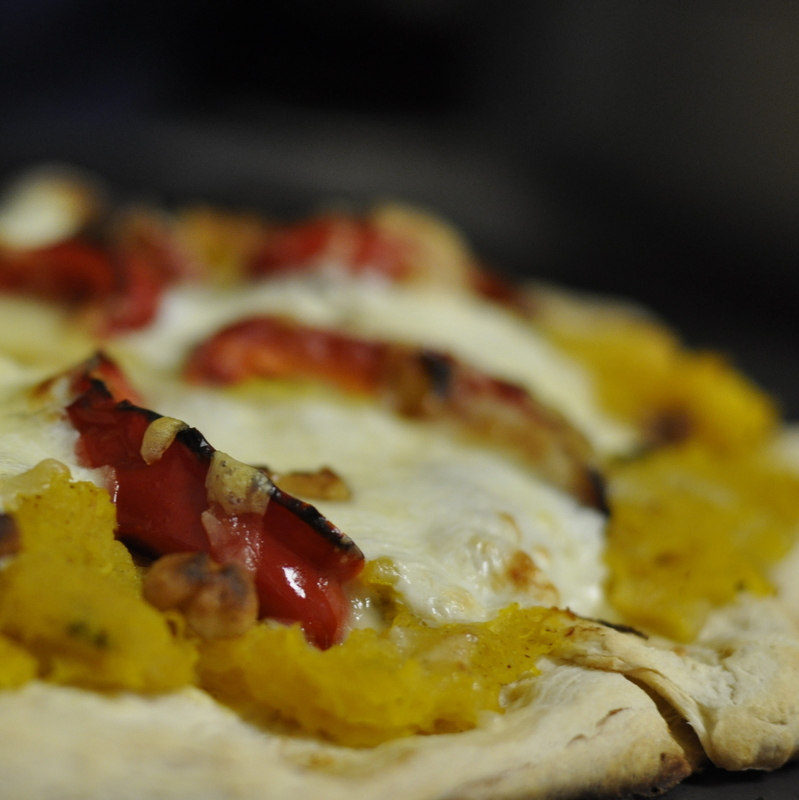 We made a pizza with savory pumpkin on top and it was delicious. It tasted like butternut squash pizza (which is awesome), but less sweet and a little punchier, since I added sage and a little grated orange rind. Pumpkin pizza was made possible by this sign, which inspired me to buy eight pie pumpkins before I knew it was happening. Thunder liked the pumpkins because sticks are not usually allowed in the house. The pumpkin recipe below is delicious on its own as a side dish, if you’re not in the mood for pizza. I am including a pizza dough recipe here, but you can obviously use any crust or flat bread recipe you like. This time around, I worked with this information from Serious Eats about how Roberto Caporuscio (a partner at Keste, in the West Village) makes his pizza dough. The dough I made wasn’t bad, but it was time-consuming and tasted nothing like Keste’s, and the gentleman at Keste said it never will unless Scott builds me a wood pizza oven and cranks it up to 900 degrees. So if you don’t have your own favorite recipe, I recommend the below adaptation of this Bon Appetit recipe (which I thought was both chewy and crispy) unless you like thin crust, in which case you may want to poke around for one because this one may be too bready for you. I suggest making the dough first, as it rises for about an hour, and you can make the pumpkin topping while you’re waiting. Combine the 3/4 c. warm water and the package of yeast in a small bowl. Let stand 5 minutes. Combine the 2 c. flour, the 1 tsp. sugar and the 1 tsp. salt. Add the yeast mixture and the 3 tbsp. olive oil. Work dough into a sticky ball. Knead dough for at least a minute until smooth, adding additional flour if it is very sticky. Lightly oil a large bowl with olive oil. Place the ball of dough in the bowl and cover with plastic wrap. Let rise for about an hour, until it is doubled in volume. Punch dough down and work into a circle. Directions for assembling the pizza follow after the instructions for the toppings. 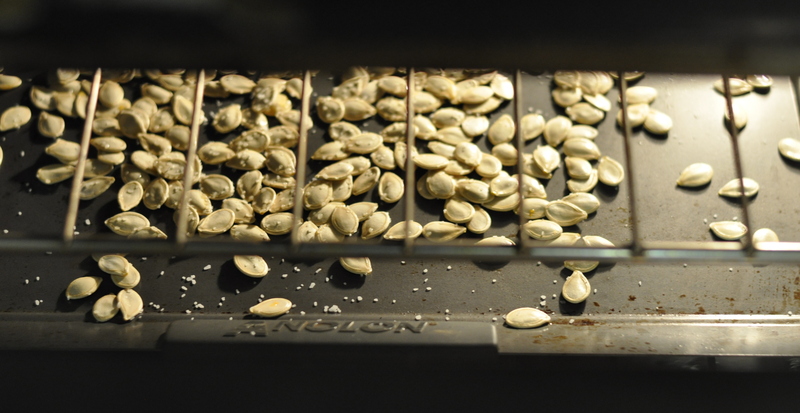 Place pumpkin halves face down in a glass baking dish with 1/2 inch of water. Roast for 30-50 minutes, until a fork goes smoothly into the pumpkin. The exact time is not important, since you will be sautéeing the pumpkin on the stove as well. In the meantime, wash the red bell pepper and remove the ribs and seeds. Cut the pepper into strips about an inch wide. Toss strips in 1 tbsp. olive oil. Place strips on a cookie sheet and roast in the same oven as the pumpkin until tender and skin is blackened in spots, or about 20 minutes. When each is done, remove the bell pepper and pumpkin from the oven. Let pumpkin cool for a few minutes. Set bell pepper aside, as it will be atop the pizza separately, not in the pumpkin mix. While the pumpkin is cooling, roughly chop half of an onion. In a sauce pan large enough to hold the pumpkin, sautée the onion in 1 tbsp. butter. The onion should turn translucent but not burn. Add the pumpkin, the remaining 1 tbsp. butter, the 1 tsp. sage and the 1 tsp. thyme, the 1/4 tsp. cinnamon and 1/4 tsp. nutmeg to the sauce pan containing the onion. Add salt and pepper to taste. Sautée over low-moderate heat at least 20 minutes, until tender, stirring occasionally. Grate the peel of the orange and add 1 tsp. of the peel to the pumpkin mixture. Add the juice of the orange and sautée another 10 minutes. Adjust spices to suit your taste: depending on the size of your pie pumpkin, you may want to add more of the thyme, sage, salt, nutmeg and cinnamon until you get a good balance of flavors. Remove from heat until it is time to assemble the pizza. Preheat oven to 500 degrees or as high as it will go. Work dough into a round or twoand place on a cookie sheet or pizza stone. Spread pumpkin mixture on first, then add the slices of red pepper and rounds of mozzarella cheese. Sprinkle the gruyère on top and finish with the walnuts. (Note that the cheese amounts above are approximate; do it to taste.) The walnuts do not have to be toasted in advance, as they will toast on the pizza. Cooking time really depends on the density of your toppings: it took ours about 20 minutes until the crust was crispy and browned. Richard Marx and glasses for me, but I hear ya! The eighties are a lost decade. But if nostalgic college dance parties are any gauge, I don’t really think I missed much. Hi, Christine! This is neither here nor there, but after writing this, all I could think about was that scene from 16 Candles where Joan Cusack is trying to drink from the water fountain at school with her head-gear on. “They wrote to each other about outer space.” Hahahahaha! Love it. I know it! She was for real. I am lucky they lived so far apart, or who knows what would have happened! This post is so awesome. I didn’t get to go to space camp but I did buy neapolitan freeze-dried ice cream sandwiches meant for astronauts that they sold at museum gift shops. Usually next to the rain sticks. Also, can’t wait to make that pumpkin pizza. Hey Wobblin’ Goblins! That ice cream was awesome. They recently had a space ice cream making CLASS at the Space Center here and we didn’t go because, well, we probably would have needed an age-appropriate child in order not to weird everybody out, and we didn’t borrow one in time. 🙂 By the by, I listened to Sledgehammer on your site and you are totally right–you can’t be in a bad mood afterward. Ups, is it a she? 🙂 Doggie? Hahaha, Freglish :). She’s adorable:). Wow, I am jealous that you got to see a shuttle launch– that must have been really cool. We discovered a cool program you could download called “Universe Sandbox” where you can see the solar system and then manipulate certain variables to see what the effects are (like you can reduce the Earth’s mass, or make Venus spin faster, which totally messes everything up). If you are a space-nerd, you may love it! Love it. 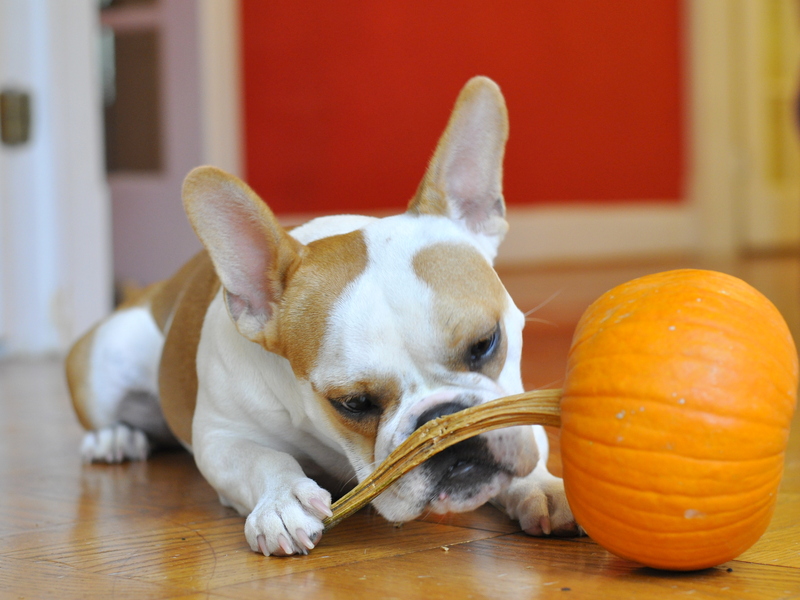 What a great use for the pumpkin. If you want to try a new crust, Zoe Francois just came out with a new no knead pizza dough recipe that’s amazing. Love your site too btw! Thank you for the crust and the kind words! I will try it next. But I may just want to dedicate my time to mastering that vanilla cardamom peach pie on your site. Might have swooned a little bit when I saw that. I love your blog from top to it’s oh so perfect-pizza-crust bottom. You crack me up! Sonia, why thank you for the kind words! Your new house looks amazing. 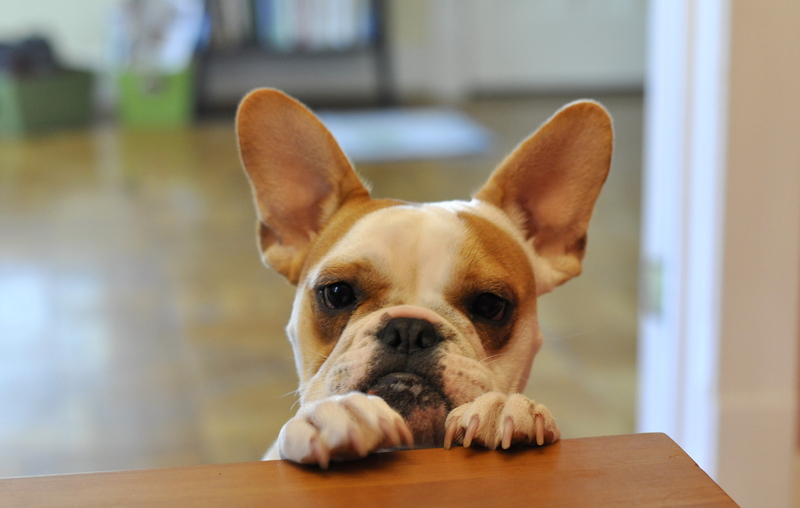 The idea of taking all my meals outside on that deck is wonderful– how exciting! It’s not that the honey badger doesn’t *know* the trivia, it’s that it doesn’t *care*. HA! I didn’t think of that. Nice one. Happy Tasty Tuesday! We love this recipe and it is featured on our Recipes for the Food Holidays of October! Thanks for sharing! !